Time for the second update post for EverEmber Online since re-release! There has been a very large amount of work done recently and although the dev team has been very busy, we managed to push out a LOT of balance, bug fixes, and new content as well as lots of new content incoming soon! 4 - Eagle Attack: You summon an Eagle to attack the target, giving 10 hits in 10 seconds (Wind Element) Warrior and Archers skills have the mp cost decreased. 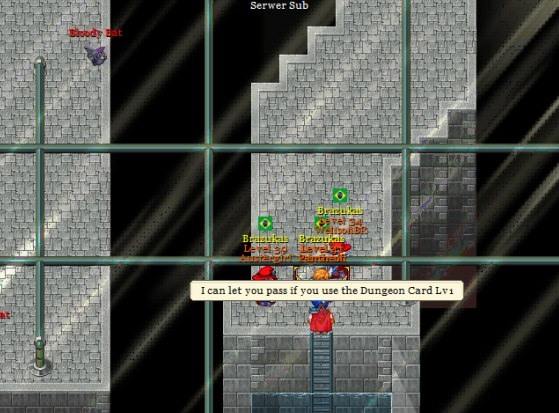 New Party Dungeon: Underwater sewer room (Needed Raid card to enter) This dungeon is party map, if you enter alone, no one can enter in same map as you, it will in the same map, but different dimension. 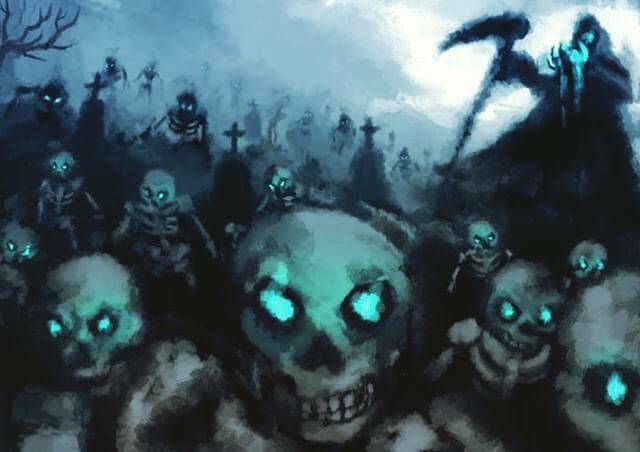 Mobs now have elemental defense/attack Bones now changed to Soul Stone, you will need soul stones to buy dungeon raid cards! Desert cave map now have the entrance for "Demonio de Areia" raid boss, you need get the key from the guardian inside the cave. each player need 1 key, do the quest "A mysterious treasure" to get the climbers hook. New maps: Forest of Illusion and Forest of Dreams. Shops revamped, some items get price changed, now the gold currency will be more used. This is the very first EverEmber Online update since the re-release, and we plan on keeping them weekly at a BARE MINIMUM. We'll also do Q&A and minor update posts occasionally. We're going to host Double Exp events 3 times in the weekends, 5PM GMT and 10PM GMT on Saturdays, and 5PM GMT on Sundays. The group events will be announced ahead of time, this weeks group event will be the Battle against Naatsoe! 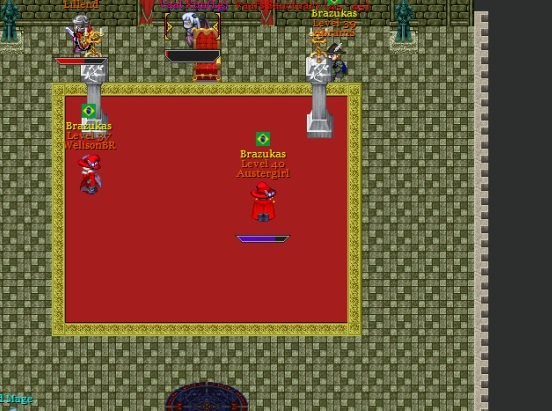 Team up with your friends at 10PM GMT on Sunday to fight Naatsoe, a slime monster that heals and spawns more slimes. If you, the adventurers don't kill it in time, i'll produce enough slimes to destroy all of EverEmber! Rare spells will be given out to those who fight Naatsoe as well as a rare event teleport! This list contains many MANY updates to balance and bug fixes! -Npc: 'Demonio The Areia" has the name changed to "Demonio De Areia"
Wanna talk with players without having to open up your internet browser, type everember.com, log in, open the forums, and make posts? Then join our Discord server! Its super easy. EverEmber Online is going back online at 2PM EST, 7PM GMT. This post will be updated to reflect if the re-release is up or not! We will be helping players out near the beginning. Just click on the chat box bottom left and change the channel to global. We're happy to help! We will also be doing some fun events throughout the day, so keep your eyes peeled! Also, if you have any event ideas, just message us on discord or reply on this post! Register an account in game, and play! Can't wait to see you in EverEmber! The official release date for EverEmber Online will be on November 25th, at 2PM EST or 7PM GMT! We're so excited to have you all join us! All features will be available other than the Donator Island, which will open a week after. Try to spread the word! We'll run a raffle after re-release for keys for EverEmber Reborn if you helped share the game! Looking forward to seeing you ingame! Lets cut to the chase! EverEmber Online will be back up and running on November 25th, 2018 at approximately 2PM Eastern USA time or 7PM GMT! In order to play the game, when the servers are up, PLEASE register ingame. Your forum accounts do not carry over to EverEmber Online! We have also been testing AI capabilities and doing lots of stress tests on the EverEmber Reborn server! 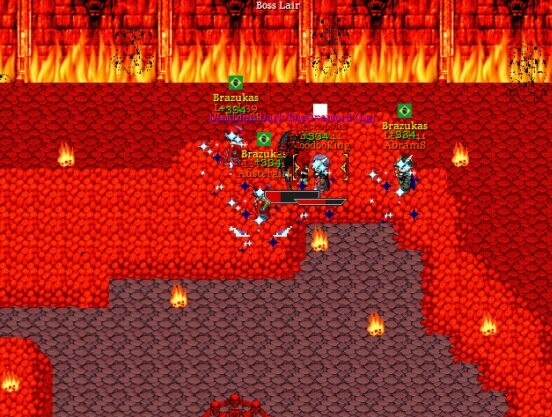 The screenshot below can show you a little chaos when you're being attacks by a 50+ skeleton army! Hope to see you in the world of EverEmber soon! Its been quite a while since we've last made a post on the website. Ever since we did some of the website updates, we didn't really update anything on the website and we do apologize. But apologies aside, we have some really exciting news for everyone! We're re-releasing EverEmber Online this Thanksgiving weekend! That's right! We don't want to bore you to death with occasional updates about EverEmber Reborn (Although exciting, we are working on this game in our spare time so bare with us) so we will bring EverEmber Online back to life with LOTS of new features, updates, and quests relative to our original release! Check out our trailer for EverEmber Online! Feel free to share the video, like it, and sub to our channel if you want live updates of new videos we post! We will be uploading tons of EverEmber Reborn related content as well, so don't jump out of your seats! The official date will be announced with the exact date and time when the servers will go live as well as some tutorial videos! Hope to see you all in the land of Ember! Poll: What content do you all want to see? We've had an exciting week doing various testing for the game lately and can't wait to show you some video footage! We're also in the middle of working on a cinematic trailer that is nearing completion (a few more weeks). Don't worry, your money won't go to thin air, there are rewards attached to the donations as well! Feel free to tweet this announcement or share it on facebook. The people vote the more exciting the next event will be! Enjoy this preview of an upcoming art piece. See you in the world of EverEmber! If you're reading this you may have noticed that there are a few changes to the website. Most of the changes were done for the sake of speeding up the website, some in order to make the website look better. The background should no longer cut off on large display monitors, the logo is now the new EverEmber logo. Favicon should change to the dragon and when posting our website link on other websites, you won't have the old ugly EE letters appear as a thumbnail, you'll now have the EverEmber Dragon. The background is now 1/10th in file size and logo 1/2 the file size, meaning that the website should load much faster on any device, mobile or not! On other notes, we have a crazy amount of cool information and news posted almost daily on our Instagram, Facebook and Twitter. Be sure you follow us! Soon we'll be giving away our first free alpha key and various EverEmber gear and loot both ingame and IRL. Be sure you follow to catch onto these giveaways! Here's an exclusive preview of a new concept art piece of the reaper raising the dead by our artist Akram! Today we have some really neat news to talk about! -We've been reworking different areas in the game, such as the Thieves cavern, Trolls passage, and continuing work on Ember castle. -MrSingularity has continued to progress in the coding aspect of the game, creating smooth combat, synchronizing movement for combat and actions between players on the server, and working on the various other systems in the game such as the inventory system, AI, and ranged combat. 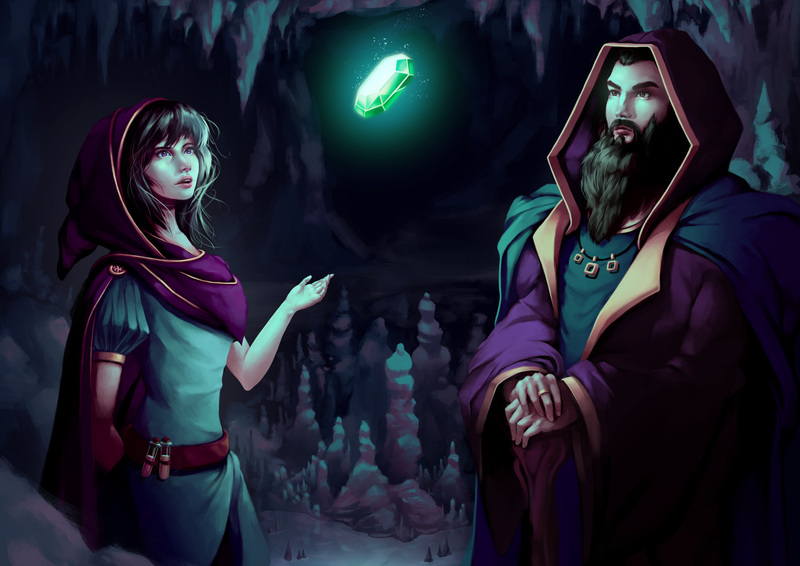 -Our artist Akram has continued to create awesome art pieces and concept art for the game, soon to be a part of our trailer. We hope to have a kick-starter ready for everyone to take a gander at as soon as we hopefully can have one. We want to make sure we have a quality game to show off. We will not "half-donkey" our presentation, we want you the player to feel like this is the most exciting game to be released. If you haven't already, follow us on Instagram, Facebook, and twitter for exclusive daily updates on the project! Hope to see you in the world of EverEmber!